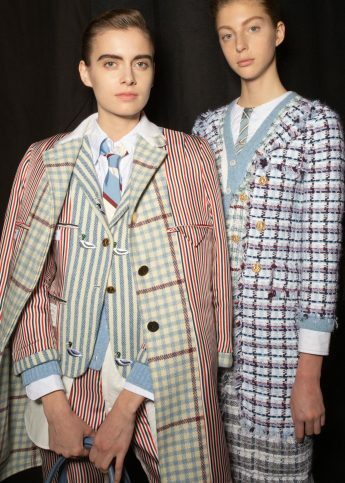 It was a forty-minute wait at the Thom Browne show, yet not a soul complained. How could they, when upon entry they were whisked into the imagination of New York’s reigning eccentric, greeted by a breathtaking display of epic proportions? Inside, a garden full of human sculptures depicted five springtime tableaus: sailing, shuttlecock, butterfly catching, gardening, and sunbathing, featuring models with marble-painted faces and jewel-encrusted seersucker suits. And that was before the show even started. For all the childlike charm, the twee exterior was penetrated by a disquieting Stepford sinisterness, as all the human sculptures remained frozen and unblinking in the spectacle’s center for one hour, while the models tried to see through opaque, blinding glasses, and balance precarious fascinators around the grass runway. There was a meta element too, with all the headwear (by the designer’s loyal collaborator Stephen Jones, perhaps his single contemporary in the arena of eccentricity) depicting other items of clothing. Hats were shaped like handbags, like dresses. Our narrator wasn’t kidding, apparently: the lives of these six sisters were ruled by fashion. Photography: Dan and Corina Lecca. Thom Browne's AW19 PFW collection brought the fun back to business attire.